Easter is just around the corner, hopping it’s way to us very soon. 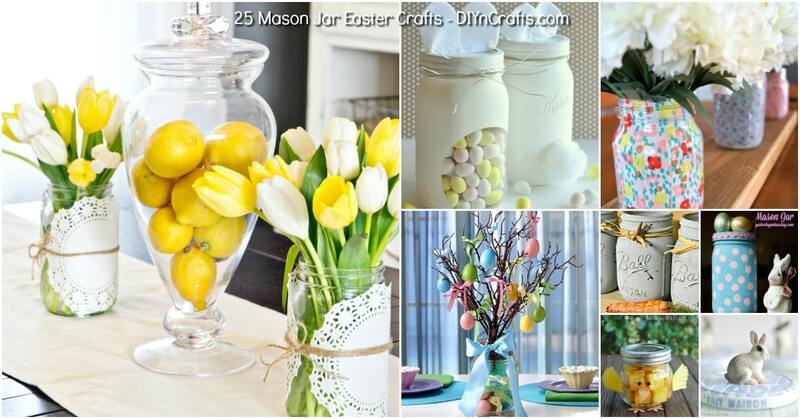 In celebration of the upcoming holiday, I’ve found 25 wonderful ways that you can incorporate mason jars into your Easter decorating. Mason jars can be used for everything from vases and candle holders to actual Easter baskets, and I love using them for my decorating. Many of these DIY Easter craft ideas involve candy – we love candy, though don’t we? They’re great for giving as gifts to teachers or family members, or adding to the Easter baskets that you are making yourself. I pretty much love anything that involves candy, especially chocolate and there are many craft ideas in this collection that use chocolate candies and many that you make yourself. There are even cookies in a jar and cupcakes that you bake right there in your mason jar. So many ideas, like these 30 mason jar organizers. You can literally use mason jars for anything! Whether you need a centerpiece for your Easter dinner table, or something to brighten up the console table, there is surely something in here that you will want to make. There are a few painted jar vases and but if you want to collect decorating projects check out our 80 Easter decorating projects. So whatever decorating or gift giving needs you have to fill, there is definitely a craft in this collection that will fit the bill. Plus, all of these projects are so very easy. You have plenty of time to make them all before Easter. From Easter trees and succulent planters to scrumptious mason jar baked cupcakes and loads of ways to store and display candy, this collection is the ultimate in mason jar Easter craft ideas. You know how much I love using mason jars for everything. They’re so very versatile and can be reused over and over again. 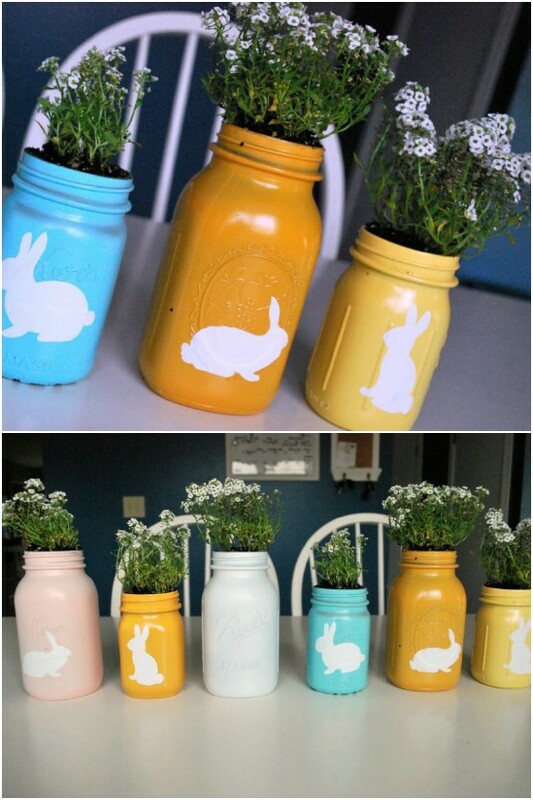 If you’ve been wondering about how you can repurpose mason jars for Easter decorating – wonder no more. I’ve found the most amazing collection of DIY mason jar Easter crafts and I’m sure you’re going to love them all! These little bird’s nest cupcakes are perfectly sized in mason jars and so delicious. They contain white cake, lemon curd, apricot and pineapple preserves and a delicious cream cheese topping with toasted coconut. 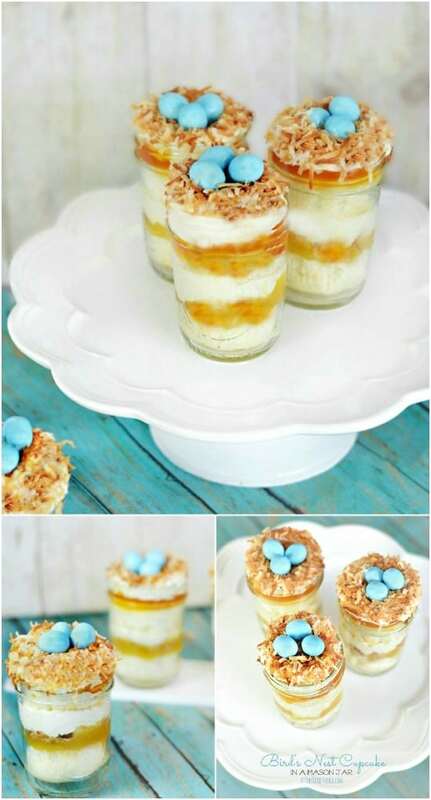 They’re perfect for Easter Dinner desserts or anytime you want something light and yummy. They’re also the perfect way to use up some of those mason jars you’ve got on hand – the smaller jelly sized jars, that is. I love using mason jars as vases – did I mention that already? Anyway, take some paper doilies and twine to dress up those mason jars and then just add some bright and colorful daffodils or tulips and you have the perfect spring centerpiece. These are so very easy and you could use jars in whatever size you have available. I love the idea of using the larger jars for these. Just wrap the twine around the doily to keep it in place and you’re all done. 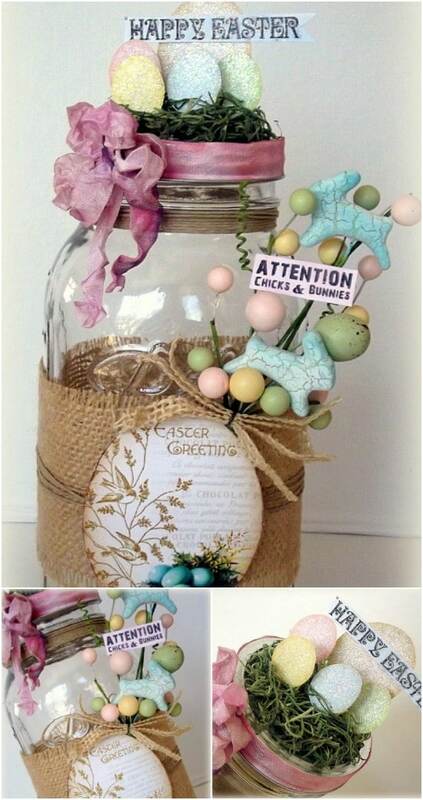 I love this bunny jar idea as a gift for a favorite teacher. You just take a mason jar, fill with mini marshmallows or whatever Easter candy you want, add some rabbit ears and you have the perfect treat gift. You can find bunny ears headbands at most Dollar Tree stores right now for $1 each. Just cut away the headband part and you’ve got the ears which you can glue onto the jar lid. Tie up with some pretty ribbon or tulle and you’re all set. These little bunny munch jars are also really cute and filled with yummy snacks. The bunny munch is made of white chocolate popcorn or kettle corn and mini marshmallows. Once you have your munch ready, decorate your jars with this cute bunny printable and add some ribbon or other decorations. These would make wonderful gifts for teachers, hostesses, or anyone that you need a little treat for. These adorable carrot inspired mason jars are the easiest way for you to use those mason jars in décor, and you can keep these out all spring and even into summer. 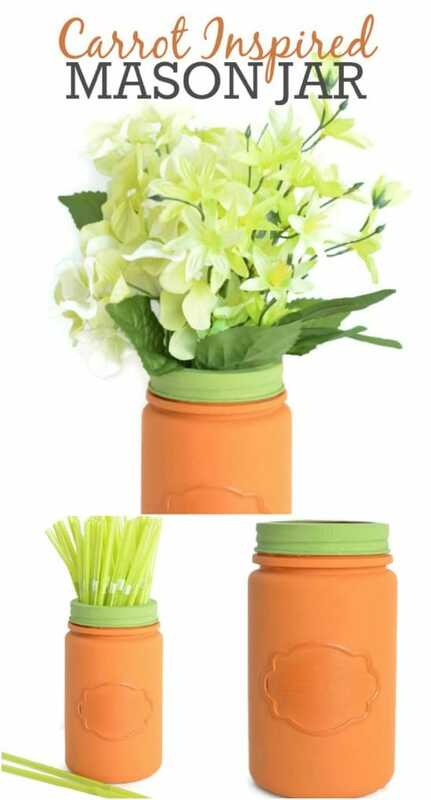 Just paint your mason jar orange and paint the lid green. It’s so easy and makes such a wonderful jar for anything. Remove the center ring of the lid and use it as a vase or use it to store your Easter candy. Whatever you do with it, it’s going to be a beautiful addition to your Easter decorating. This is such a beautiful centerpiece and such a simple idea. 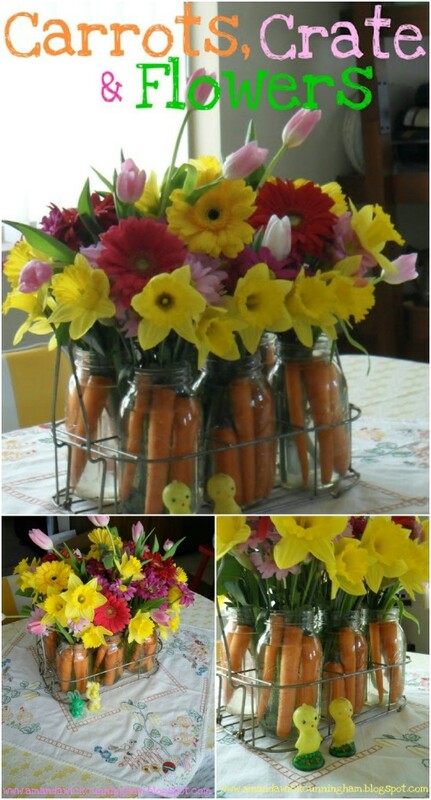 Just fill about six different mason jars with carrots and add some lovely spring flowers like daffodils and tulips. Then put them all in a wire crate. What a gorgeous display for your Easter dinner table! 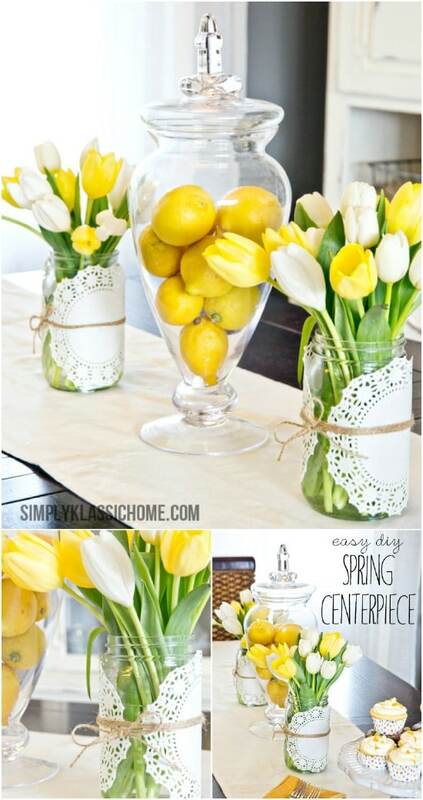 I love the simplicity of this and how just a few steps and a few minutes give you the perfect spring decoration. 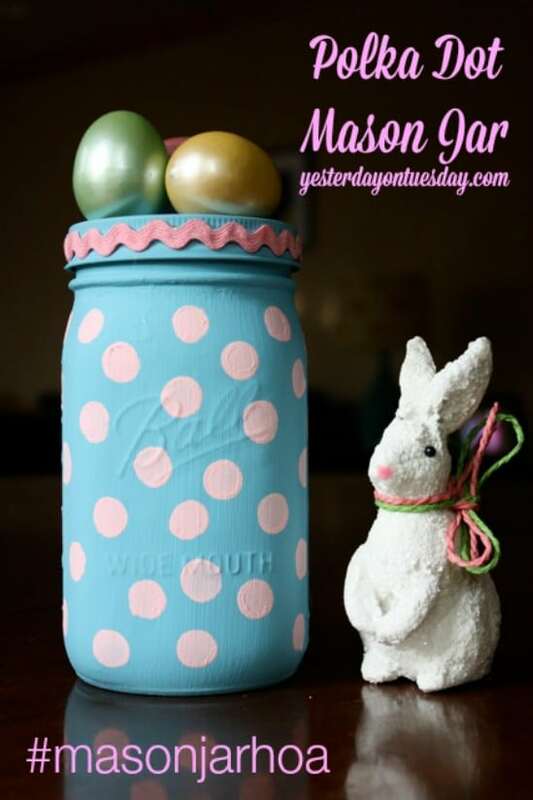 This is another great take on a DIY Easter Bunny jar made with a mason jar and just a few other supplies. 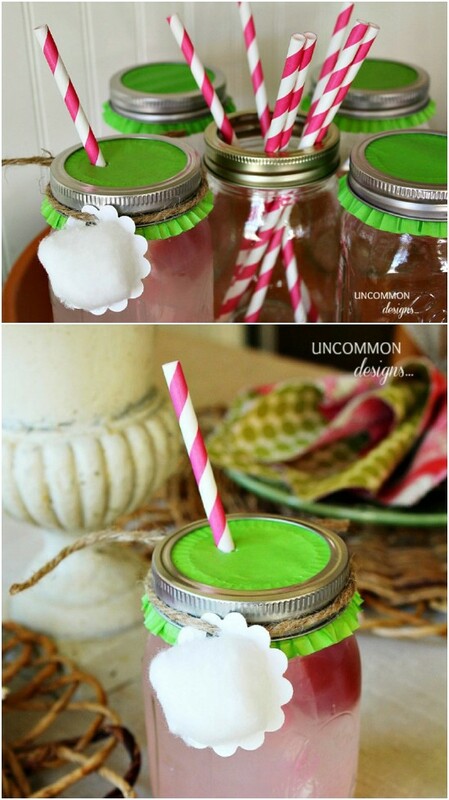 You’ll paint the jar white, leaving a clear hole somewhere toward the bottom so that you can see the candies inside. The ears can be made with felt and the tail is just a huge cotton ball or a pompom, which is really easy to make. Fill with jelly beans or robin eggs for a really colorful look and tie wire around the lid for the “whiskers”. I use mason jars for vases all the time. I love the entire look of a mason jar, whether it’s decorated or plain. These DIY spring vases are made from mason jars that you decorate with floral fabric and a bit of Mod Podge. They’re perfect for displaying those spring flowers and even giving as gifts. 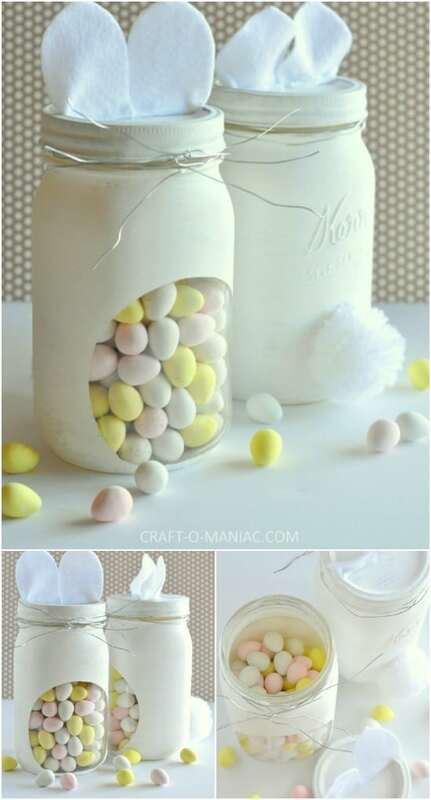 Or, decorate the lids, too and use these to store your Easter candies. If you don’t have fabric on hand, you could also use decorative washi tape or even scrapbook paper to create the designs. For these adorable little cupcakes, you’ll need those smaller mason jars – the jelly sized ones. You just bake your cupcakes in the jars – this is a great way to keep them moist – and then when they’re cool, decorate with homemade or store bought icing. Add sprinkles and even a tiny little chocolate bunny to the top for decoration. These would make the perfect Easter dinner dessert cupcakes, and they’re perfect for little ones. This yummy granola can be made quickly and when you store it in this bunny mason jar, it’s the perfect companion for Easter breakfast. To decorate the jar, you’ll need googly eyes, a pink pompom for the nose, something for the whiskers and a few other supplies. The granola has oats, chocolate chips, and bunny shaped marshmallows, among other ingredients. This is a great way to get kids to enjoy a snack that’s healthier than chips or plain candy. Drinking from mason jars is a country thing. Here in the south, half of our drinking glasses are mason jars. This is why I love these Easter drinking jars made with mason jars. They have straws and tops so they’re perfect for younger ones and great drinking glasses if you are planning an Easter party. You use cupcake liners for the tops and just stick a straw in. Well, there are a few more steps, but you get the idea. Have you ever done cookies in a jar? I love the thought of giving these as gifts and while you normally see them around Christmas, they’re so great you should be doing them all year long. Enter this colorful Easter M&M cookie jar mix. It’s cookies in a jar with an Easter twist. 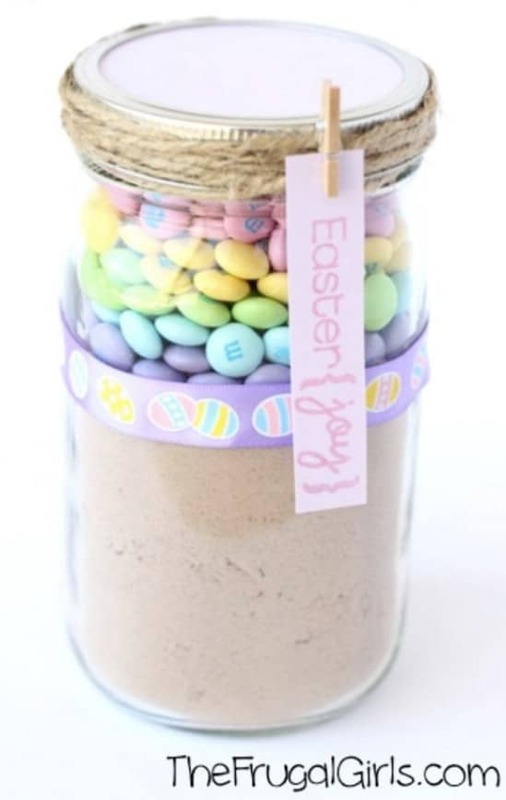 Fill the mason jar with your cookie mix and then add pastel colored M&Ms to the top and tie up the lid with a colorful ribbon or some twine. Whatever you decide to fill those mason jars with, you’re going to want printable tags for them, right? You can find so many wonderful printables that let you decorate the lids or jars themselves. Then you just have to add the treats inside and maybe a colorful ribbon around the lid and you’ve got the perfect gift for décor idea. Spray paint is the best way to cover just about anything, even your mason jars. If you’re looking for a way to use up a few of those jars, these spray painted planters are perfect. Not only is it easy to color those jars with spray paint, you get wonderful planters for all of your indoor Easter plants and flowers. Be creative and add some bunny designs to the front or just make your planters different pastel colors. Need another great treat idea for Easter that you can store in mason jars? This muddy buddy mix is amazing and looks so colorful when you store it in clear jars. To make the mix, you need candy melts in different pastel colors, as well as powdered sugar and Rice Chex cereals. When finished, these are not only delicious but also very colorful and look great inside those mason jars. You can pick up cotton candy bunny tails at the Dollar Store for about a dollar per bag. 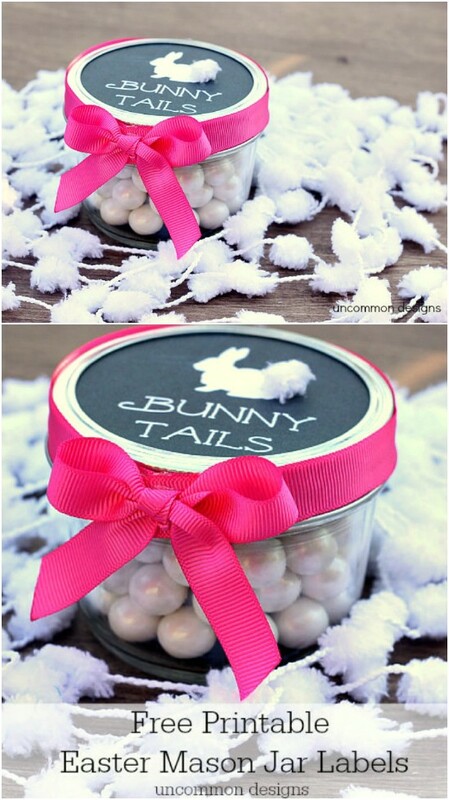 Use those colorful cotton candy treats with your mason jar to create this really colorful and fun bunny tails jar. Kids are going to love the cotton candy and it makes such a wonderfully colorful display for the counter or a centerpiece for the dinner table. 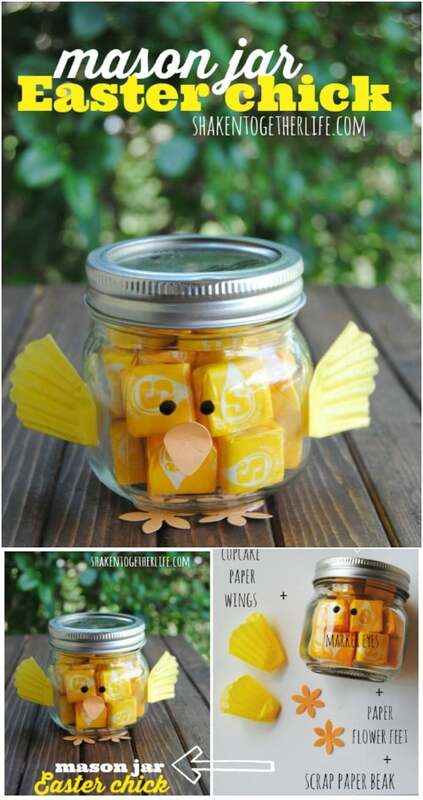 This little chick made from a mason jar is so sweet and he’s filled with yellow starbursts, which add to the color for the chick and give you a nice treat. These are perfect for gift giving or you could even add them to your kids’ Easter baskets. You need a yellow cupcake liner to make the wings, a black market for the face and a couple of orange paper flowers and some scrap paper for other features. Then just fill him with starbursts, skittles or yellow jelly beans. 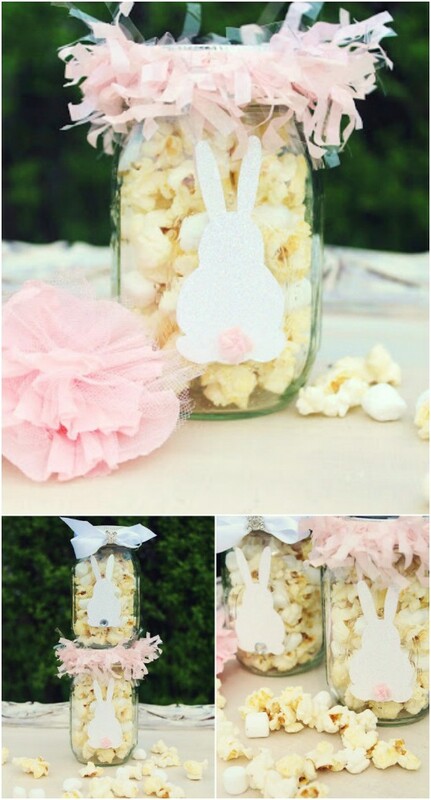 Take some pink and white paint and turn those mason jars, any size, into this adorable little bunny. 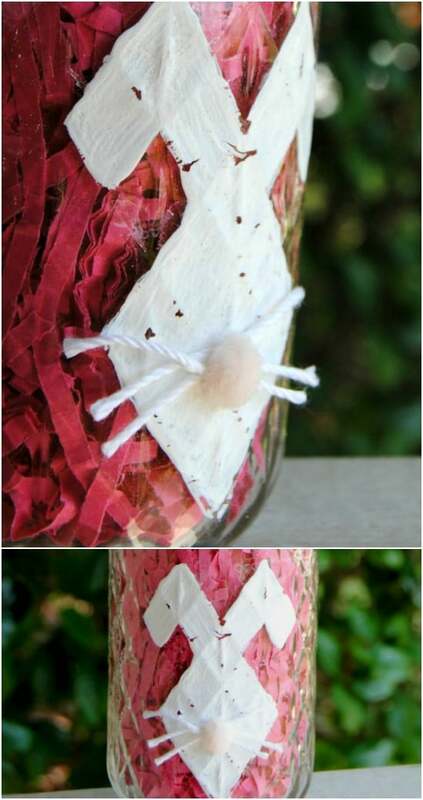 You can then use them to decorate by adding flowers or candles or put in candies and use them as gift jars. A bit of yarn and a small pink pompom really gives this little bunny some character and makes him the perfect way to decorate with mason jars this Easter. When you’re thinking of ways to use those mason jars, think about painting them with polka dots. Once they’re painted, you can use them as vases or to hold just about anything else you want. Choose colors for your polka dots that are spring like – think pastels and bright yellows – then use the jars to create a beautiful spring display for your mantel, countertop, or table. 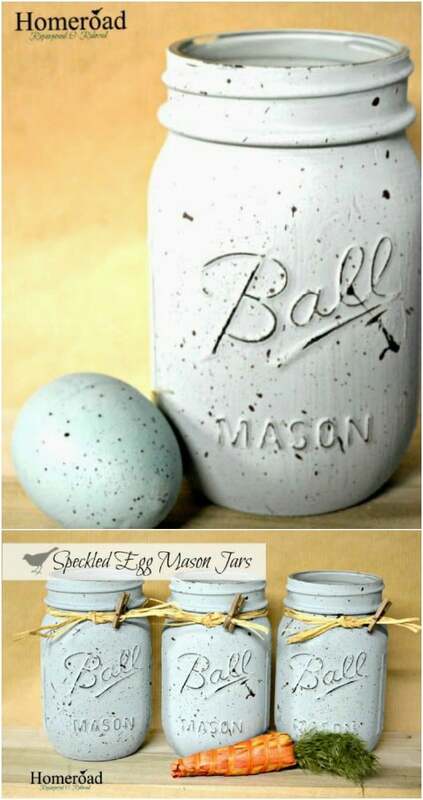 I love, I mean really love, these speckled egg mason jars. They have such a wonderful rustic country feel to them and would be perfect with your farmhouse décor. These are done with chalk paint which gives them that great vintage look. Once you’ve done the initial painting, you can create the speckled egg look with some brown paint and a toothbrush. It’s really easy and these would make wonderful vases when they’re finished. Just a few colors of pastel paints and some mason jars and you have the makings of a wonderful planter or centerpiece. 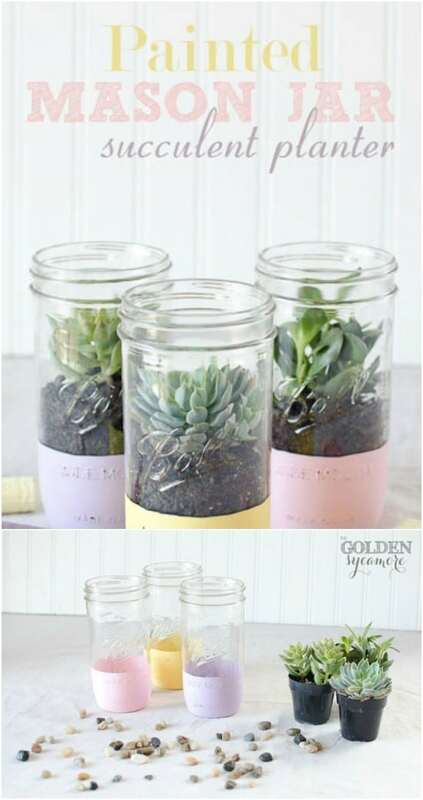 Just paint the bottom portion of your jars with Easter colors and then add some potting soil and your favorite succulents. Put these in a wire basket and you’ve got a gorgeous centerpiece, or just put a few of them in different areas of your home to add Easter colors everywhere. 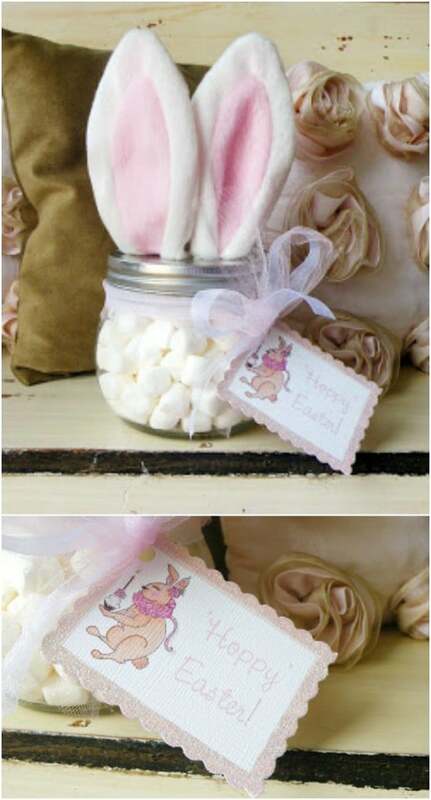 These little bunny bait jars are adorable and such a quick and easy way to add some Easter décor to your home. They also make wonderful gifts. 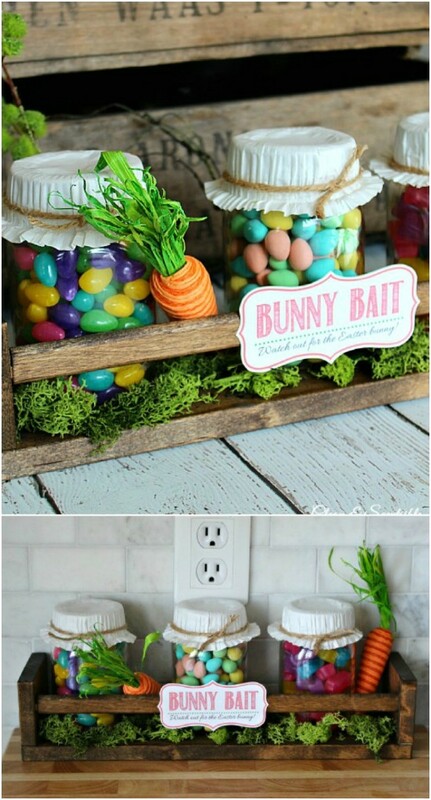 Just fill the jars with robin eggs, jelly beans, or other Easter type candy and cover with a cupcake liner. You can tie the cupcake liner on with ribbon or twine for extra decoration. They make a wonderful centerpiece for the dinner table or a great display for the mantel. Put them together in a wooden crate and add some moss for a really nice display. Now, you could use this on the mantel or anywhere you wanted. It’s a mason jar that is literally filled with Easter colors. Burlap gives it that great farmhouse country look and the pastel eggs are beautiful on top of a battery operated candle. This entire project just screams springtime, doesn’t it? I love the colors and how easy this is to put together. You can have it finished in about half an hour. 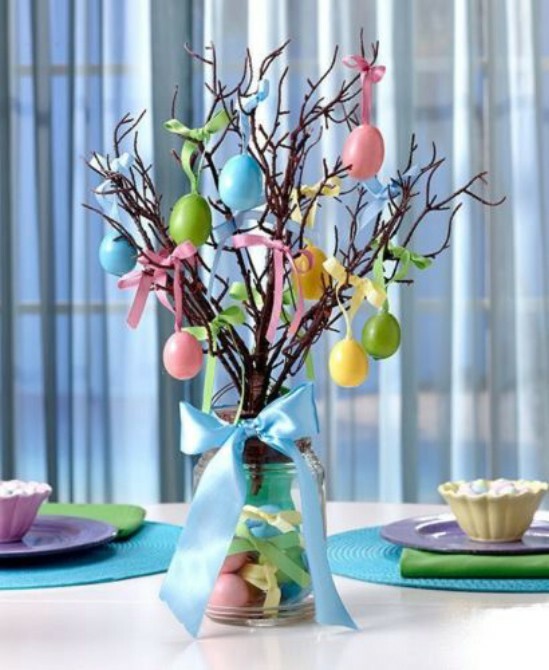 Use that mason jar to house your Easter tree! If you really want to add some country rustic looking charm to your home décor, this is a great idea. Take a mason jar and “plant” a small branch or twig – you can even paint your tree white first – and then decorate. Add some burlap or twine to the top of the jar for added decoration and you can use plastic eggs to hold your “tree” in place inside the jar. Whatever you put inside those mason jars, you can decorate them with these adorable little jar toppers. The toppers can be made from plastic decorations that you get at the Dollar Store – they’re just a dollar for several. 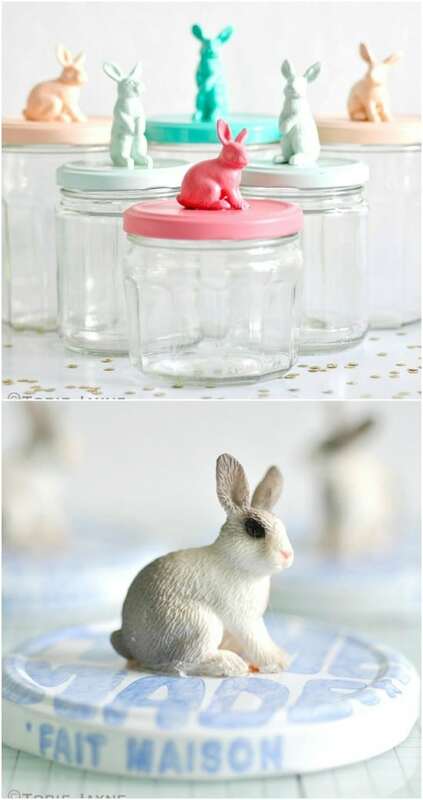 Just glue them to the lid of your jar and paint the bunny and the jar lid in a nice pastel color. Use these for keeping your Easter candy fresh or for gift giving.